Boring Like A Drill. A Blog. » Who are the People in Your Neighbourhood? Who are the People in Your Neighbourhood? As any teenager can tell you, it’s Jeremy Bentham, famed early 19th century utilitarian thinker and inventor of the panopticon – every cultural theorist’s favourite gratuitously overused buzzword (although this has recently been deposed by ‘subaltern’). For reasons best know to himself, Bentham thought it would be practical, or instructive, or something, to have himself embalmed after his death and kept on display at the College. Perhaps he foresaw the need for cheap TV filler programs, which is where I first learned about his ‘Auto-Icon’ many years ago, but had no idea where he was kept until I (literally) stumbled across it at the dead end of a corridor with a security guard parked behind a desk nearby. The ‘Auto-Icon’ consists of your preserved philosopher in his own nicely-polished wooden cabinet, doors left open for display, but protected by a pane of glass – either to keep the pong in or the students out. I was going to ask the guard if the glass was bulletproof but something about him suggested he’d had enough dumb questions about keeping watch over the dead guy all day. The whole thing is mounted on little brass casters so he can be easily wheeled around campus in his own personal rosewood privy. To tell the truth, there’s not much corpse left to look at. That’s not his head but a wax replica: something went wrong with the embalming process that left his noggin looking like an orange you find at the bottom of your garden sometime in late autumn. The head was left on a plate on the floor of the cabinet for many years before finally being removed, not so much because it was gross as because it was a favourite target for student pranks during Rag Week. His skeleton is somewhere underneath those clothes, but I gather that’s about it for mortal remains. The original panopticon was Millbank Penitentiary, which was torn down a little over a century ago and the Tate Gallery built in its place. So now you know. 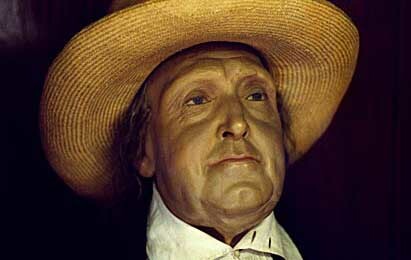 I think they should have made the hat out of wax as well, then possibly he'd look less fake? I could ask you what makes anyone think a preserved corpse is a nice ornament to have about the place, but I have a fair idea of the naswer already. My god, I remember learning about this guy at uni! It is so cool that you found him. I must seek him out myself when in London later in the year. Awesome. Laura, at least you can shut the doors on it, in case you have a squeamish relative visiting or it makes you feel selfconscious when you've just gotten out of the shower. Jellyfish, I need to go back to make sure he stays in the same place, and they don't wheel him around campus from place to place to keep people on their toes.